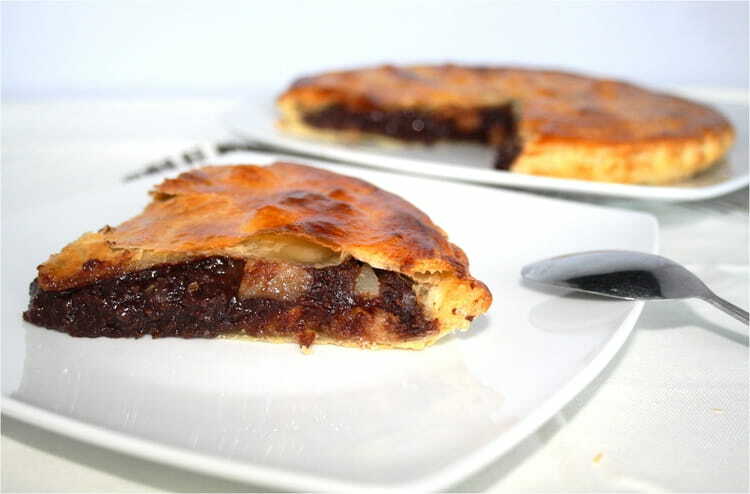 Voici une nouvelle recette de galette des Rois revisitée, cette fois ci au chocolat et à la poire, une alliance qui a fait ses preuves ! 1 Faire fondre le chocolat et le beurre au micro-ondes pendant environ une minute à 650 w puis mélanger bien. Dans un cul de poule, mélanger la poudre d’amendes et le sucre, ajouter le mélange chocolat / beurre puis les œufs entiers, mélanger afin d’obtenir une préparation homogène. Peler, épépiner et couper les poires en dès. 2 Dérouler les pâtes feuilletées, étaler la préparation au chocolat sur le premier disque jusqu’à environ 1, 5 centimètre du bord, ajouter les morceaux de poire, puis la fève vers le bord, recouvrir du deuxième disque. Souder les deux disques en humidifiant légèrement le bord avec un peu d’eau et appuyer légèrement avec les doigts sans écraser les bords. 3 Façonner le contour de la galette à l’aide du dos du lame de couteau en « poussant » le bord tout le tour, tout les centimètres environ (ou plus si vous souhaitez plus large). 4 Réaliser ensuite des motifs sur le dessus de la galette (toujours à l’aide du dos de la lame d’un couteau). Pour ma part j’ai réaliser des arc de cercles en partant du centre de la galette. Puis percer le centre de la galette de sorte que l’air puisse s’échapper pendant la cuisson. 5 Mélanger le jaune d’œuf avec un peu d’eau et étaler une couche sur la galette, réserver au réfrigérateur 45 minutes. Préchauffer le four à 200°c. Enfourner 25 minutes en surveillant la cuisson. Déguster tiède ou froid selon le goût. I really like your writing style, good information, appreciate it for posting . « Your central self is totally untouched By grief, confusion, desperation. » by Vernon Howard. This is really fascinating, You’re an overly professional blogger. I have joined your feed and sit up for seeking more of your magnificent post. Also, I’ve shared your website in my social networks! You actually make it seem so easy together with your presentation however I to find this topic to be actually something that I feel I’d by no means understand. It seems too complex and very broad for me. I am looking ahead to your subsequent publish, I’ll attempt to get the hold of it! I have read several just right stuff here. Definitely value bookmarking for revisiting. I surprise how so much effort you set to make the sort of excellent informative web site. Fantastic blog! That is a very great tip, especially to people new to the topic. Thanks for finally discussing this! I’ll discuss this website with my Reddit group. I’m going to name my son after you. I bet you probably make babies laugh. I’m super on the same side as you. Thanks for writing this awesome website. Be cool if you lived close so we could hang. I can not believe all I just learned. You’re obviously very knowledgeable about this subject. Keep doing what you are doing great articles similar to this one! After reading this I know I might never be the same person. Your blogs make me think a lot. Keep up the magnificent quality writing, it is rare to see a nice post like this one these days. Ever become burnt out by writing all these great articles? Might there be any scientific articles on the subject or any closely related subjects? I’ve been surfing online for more than 6 hours today. Might you have any more helpful insights? On a scale going from 1 to 10. You’re a 11. Right on with this article. I just shared thispage on my Instagram. I’m not sure where you’re getting this information, but great topic. Thank you for the epic article. I was going for a jog on Saturday when I discovered this. Will you be writing any additional articles on this topic? Because I’d sure like to discover more about this. ﻿Your write ups really make me to think more about how I see the world. Have you ever thought about including a little bit more than just your articles? I mean, what you say is fundamental and everything. But imagine if you added some great pictures or video clips to give your posts more, « pop »! Your content is excellent but with images and clips, this blog could definitely be one of the greatest in its niche. Great blog! I bet top Facebook pros would love this. I named my pet hamster after you. I really get excited thinking about fresh posts from you. You’re a very informative article content creator. Hey, that sure is a smart way of thinking about it. If you can, write me an email and we will chat because I have an idea I think you will like. Well I definitely enjoyed reading it. This subject provided by you is very constructive for accurate planning. I’m impressed, I have to say. Actually not often do I encounter a weblog that’s each educative and entertaining, and let me inform you, you’ve got hit the nail on the head. Your thought is excellent; the difficulty is something that not enough persons are speaking intelligently about. I’m very glad that I stumbled throughout this in my seek for one thing relating to this. Some genuinely wonderful blog posts on this website, thanks for contribution. « The spirit is the true self. » by Marcus Tullius Cicero. Hey I am so grateful I found your blog page, I really found you by accident, while I was researching on Bing for something else, Regardless I am here now and would just like to say thank you for a incredible post and a all round interesting blog (I also love the theme/design), I don’t have time to look over it all at the moment but I have book-marked it and also added in your RSS feeds, so when I have time I will be back to read a great deal more, Please do keep up the awesome job.